Ahoy for the boys (and a terrific discount!) - Stop staring and start sewing! My niece has 3 boys and they are a serious crack up. You can get tired just watching them. My sister and brother-in-law (their grandparents) made an amazing pirate room for them including a triple bunk bed. I'm always late getting their birthday presents out but I finally put something together today. I made these 3 pillowcases in about an hour! 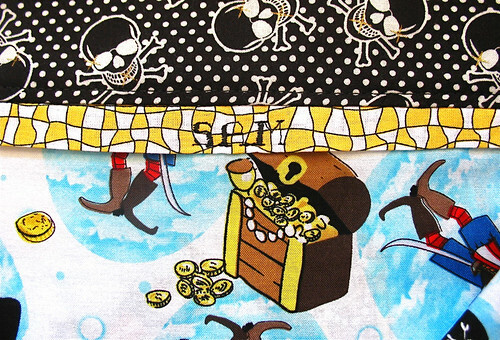 This particular pirate fabric wasn't my first choice but JoAnn's was out of the one I wanted so this was a cute second choice. I used my machine to embroider their names on them so there will be no fights over who's pillow is who's. This is for Sam (who's middle name is Francisco, really it is!). The kids discovered a really amazing bug outside of our door yesterday. 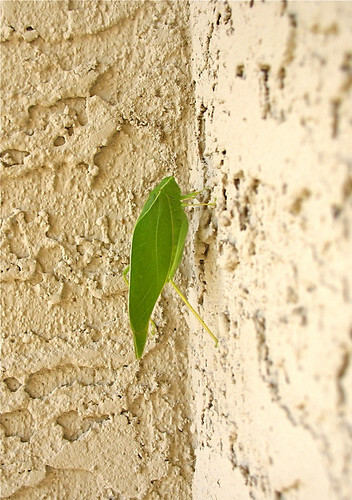 Look, it looks like a leaf. Isn't that amazing? Please run over to Tanya Whelan's blog and look at the things she's made with her new line, Darla. It's so pretty it makes my stomach do flip-flops! I'm ordering the whole line for my store and I can't wait. I'm also privileged to sew up a sample dress for Paula Prass who has a new line coming out for Michael Miller. It's such a treat to get to play with her fabric. It's got dots, butterflies, and birds, oh my! I need to make more room in my store so if you want to grab some great stuff I'm giving all my blog readers an extra 10% off if you use the coupon code STOPSTARING when you check out. 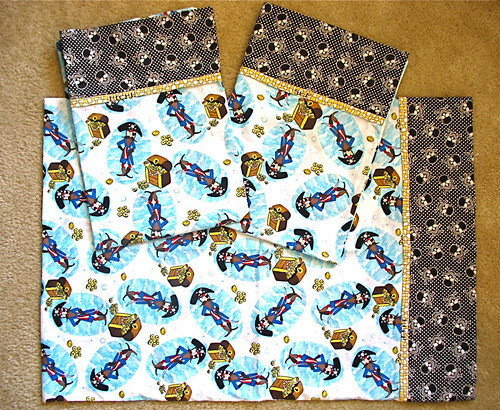 I already have Ava Rose, Garden Party and all the Sis Boom fabrics marked down to 7.50 yd through this weekend so you can really get these amazing fabrics at great prices! Thanks for shopping! This discount is over but I m sure I'll have another one before too long!